TeechConsult@BlogSpot: English is rubbish... really! Just don't study English, okay? Stop NOW!!! 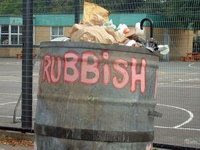 English is rubbish... really! Just don't study English, okay? Stop NOW!!! An article entitled ‘Poor English A Drawback’ (The Star, May 9, 2004) talked about the lack of English proficiency among Malay graduates. As an academic at a predominantly Malay university, I have had plenty of opportunities to teach my students the language. I question the assumption that Malay students are bad learners of English. It is not a question of whether Malay students lack the confidence or are shy when they have to use the language, as the article asserted. The real issue here is about relevance – how can we make Malay students see the relevance of the language in their lives? Let's face reality. You will neither starve to death nor get hopelessly lost in Malaysia if you are unable to speak English. Outside the small pockets of English-speaking communities, Malaysians are likely to resort to their first language to communicate. It is more natural and helps us to identify with our ‘own’ people. So what can one do to make English mean something, anything, to students? Well, I constantly remind them to speak in English during lectures. In this way, I find that slowly, even those who are initially reluctant to use the language, can be coerced to use it. Perhaps I am lucky because I teach 'English for Occupational Purposes'. My students have a real need to understand and use the language. Explaining the finer points of telephone conversations, ways to make oneself heard in presentations and handling complaints on products and services means English is relevant and ‘real’ to them. Research suggests that students find it hard to master English because they have no real use for it. Those who are proficient are avid readers, love to watch English cartoons on television, or are trained to speak English from young by their parents. In other words, learners learn English when there is a real reason to do so. My students all agree that it's more fun to practise English when they have a purpose to achieve. Students are sometimes too immune to all the 'good' things that mastering a foreign language can bring - sometimes some of them could not care less about this. At tertiary level, we should stop talking about the benefits of learning English. Just let the students have fun with the language – with a communicative purpose, of course! Now my only misgiving is this. Once my students finish their course, they will be sent out for industrial placement for a semester. If I could, I would not let them do so. Do you know why? Because, when some of them returned to me for their last semester after their stint in the 'real world', I find that their English had deteriorated. I am still collecting data on this strange phenomenon. But my hunch is that when the students go out to the workplace, they do not get the chance to speak English. Sometimes, speaking in English is actually frowned upon, depending on the institution one works for. If it is the government sector, you know what to expect. But strangely enough, even in some private companies, English is simply not used, especially when the majority race owns the business. So, the circle comes full cycle for my Malay undergraduates. Seriously then, can you blame them if their English is bad? This editorial response was published in the Star Newspaper's Education supplement on Sunday, July 25, 2004 - Ed. Update babe ... update ... I dah muak baca cerita2 lapuk u nie!